World Book Day today. And if you forgot your favourite paperback for your morning constitutional, then at Athuruga and Thudufushi you can still start the day off with a good read. 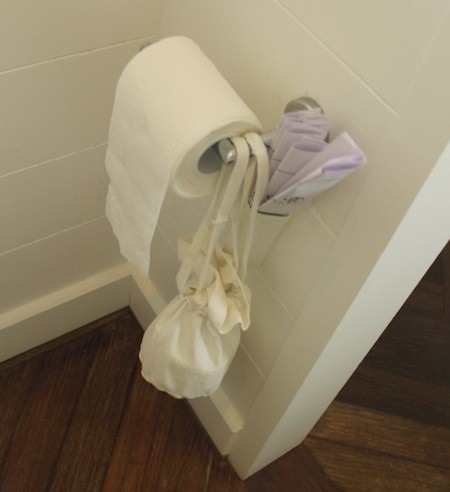 Daily news reports are printed out and left in a purpose-built holder right next the more mission critical paper of the day’s business. 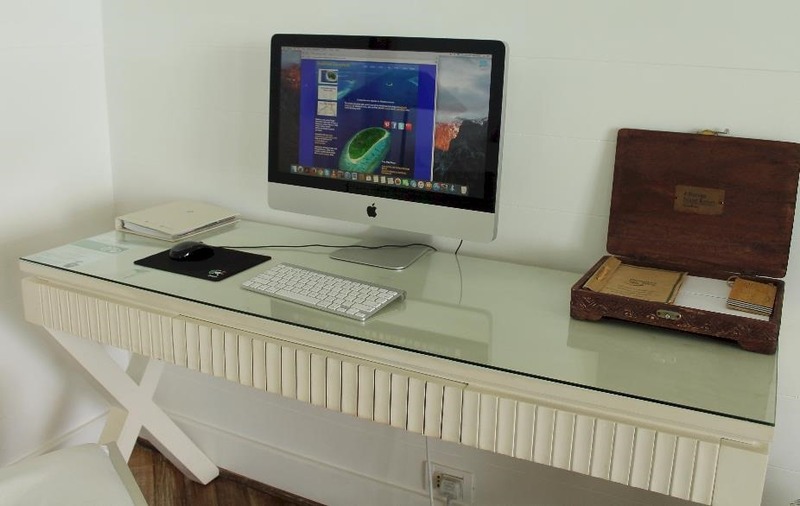 Just when you thought iPads were the peak of villa technology, Athuruga and Thudufushi go one step further with your room’s very own 17 inch iMac. Impressive in its own right, but an absolutely godsend on our tour as I had hit major PC problems with my own machine. So we were a bit backed up in downloading our camera and GoPro as well as getting down some notes and just general email and social media catch up. The big bright screen was great to sit and watch our undersea videos and select some prime clips to share with Friends on Facebook. Sometimes you just want to escape from all of the techno-clutter of the modern world…but sometimes it is the most welcome relief as a tool to help you relax and get the most out of your holiday. 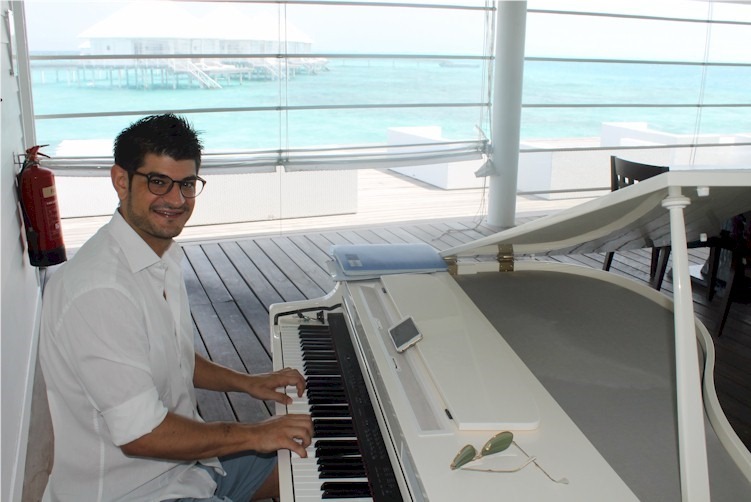 To save you complete and utter repetition as well as a haunting sense of deja vu, I am combining my visit posts to the Diamond Resorts Athuruga and Thudufushi. These are not just sister properties, but identical twins. Sure there are some subtle differences, but it takes a discerning eye to spot them. I had expected there to be more variation really. One hears a huge amount about Athuruga, but actually very little about Thudufushi. 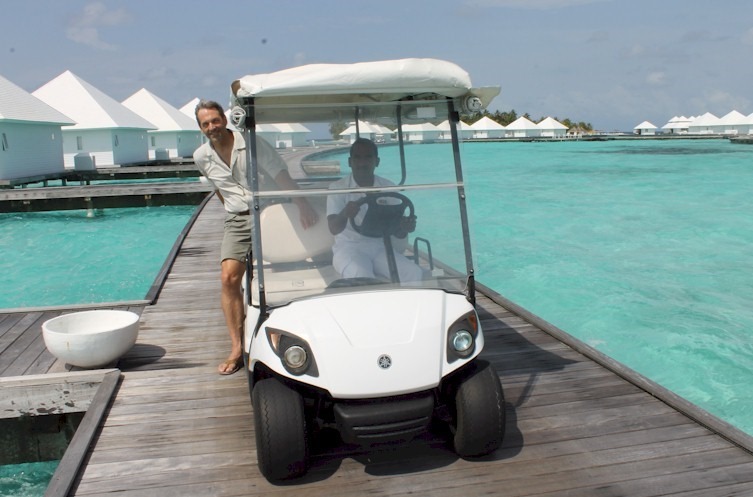 On TripAdvisor, Athuruga has 788 reviews versus about a third fewer (580) for Thudufushi. And on the TripAdvisor Maldives Forum Athuruga is very dominant while Thudufushi is rarely mentioned. Both resorts stand out with their brilliant white colour theme which just amplifies the dazzling sunshine and infuses the islands with sparkle. The classic Maldivian colour palette is sky blue, deep marine blue, lagoon aquamarine, palm green and coral sand white (which is the motif of this blog header above). Most people get lost in the blues or draw out a bit of the green, but white is often the unsung colour. In most cases, white would seem ordinary. But here, it provides the bright contrasts of the coral sands. The white accentuates the open and airy feel to the villas. The water villas are set farther apart from each other than any other resort I’ve seen. And the decks are wide and deep sheltered by a two story roof which frames a cathedral nave of ocean-side space. The villas also feature sumptuous waterfall drench showers which you would only expect to find in a super-deluxe 5+ star property so the whole water villa experience is more luxurious than its price point. Both resorts are also renowned for their food. The resorts use a less conventional a la Carte All Inclusive (Vadoo and a few others do this as well). So you sit down and enjoy a full 4 course meal served to you which make the dining a bit more of a relaxed and elegant than a typical AI buffet. Both resorts have sterling house reefs. 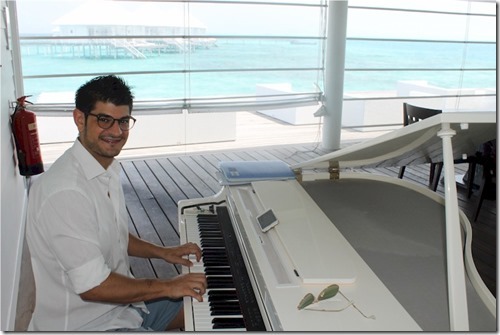 In fact, Athuruga is rated by many experts as one of the best resort house reefs in the Maldives. Unfortunately, both have been hit hard by El Nino and COTS. That said, both resorts have invested more than any other resort in marine biologists to help with this problem as 3 are posted on Thudufushi and 4 (!) on Athuruga. Thudufushi does have a good number of scattered blue and yellow Acropora coral croppings which are inspiring encouragement that these reefs will bounce back. So what are a couple of the differences? 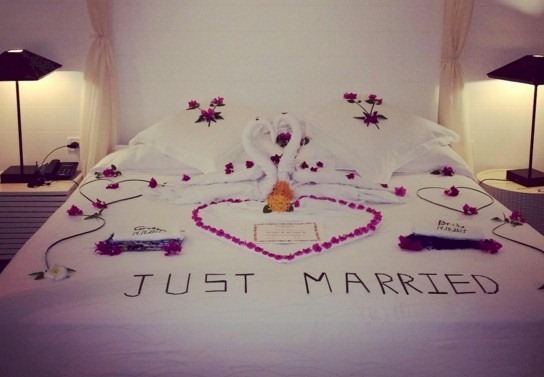 Room Types – Thudufushi has a couple of extra room types namely the Jacuzzi Water Villa and Beach Junior Suite. Size – Thudufushi is slightly larger all around. The larger island affords an inner spa garden where they hold yoga sessions, Maldivian theme nights, as well as host a table tennis and darts pavilions. Both Athuruga and Thudufushi are polished 5-carat, Triple 000 quality gems with many scintillating facets to admire. 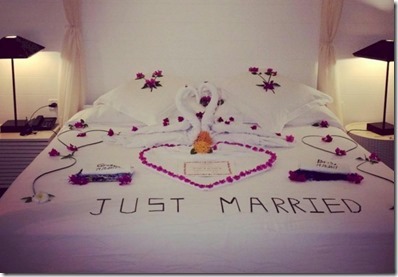 Bedroom artistry in the Maldives has evolved from a few petals sprinkled on the pillow to elaborate constructions. 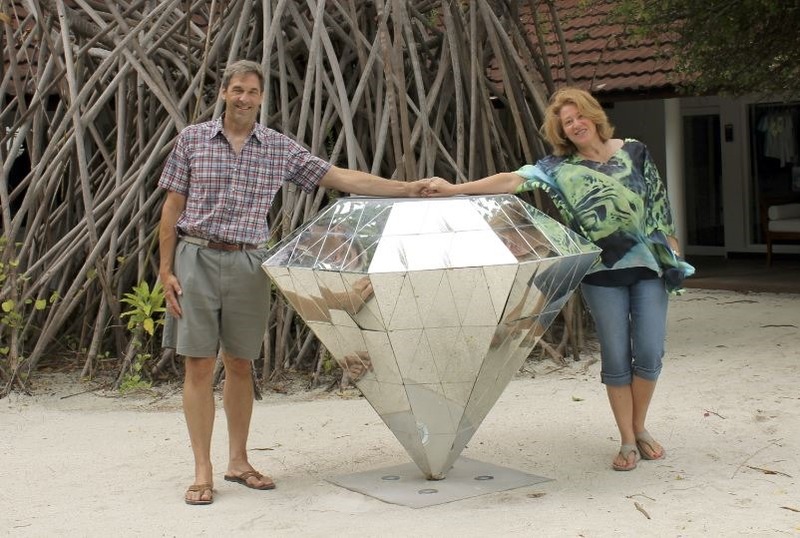 A recent masterwork is Diamonds Thudufushi’s mixed media opulent opus – petals, towel sculpture, palm fronds, lettering.